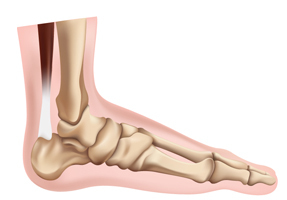 Corns, calluses and bunions are common foot issues, primarily caused by ill-fitting or restrictive shoes, or abnormalities in gait or foot structure. Calluses are hard, thickened areas of skin build-up, typically on the bottoms of the feet. They can cover large areas but are usually painless unless the skin cracks. Corns are thicker lumps that form on the outer layer of skin, usually on the tops and sides of the tows. They may start small but can grow large and can be extremely painful, especially with the pressure of shoes. Bunions are more serious than corns or calluses. These bony protrusions most often develop beside the big toe, and can become red, inflamed and sore. They can also occur on the outside of the foot beside the small toe. Never treat corns and calluses yourself using over-the-counter remedies or attempting to cut or rub them away. These methods can lead to infection or damage of healthy tissue, especially for those with circulatory problems or diabetes. Instead, trust a Physiomed chiropodist to provide safe, effective treatment, including custom orthotics to correct structural and gait abnormalities, sound advice on footwear choices to avoid further irritation, and icing, padding and safe removal when recommended, to provide immediate relief. Mild bunions can be helped by wearing custom orthotics to provide proper support and protection. Gentle treatments such as icing, soaking, padding, bandaging and splinting can also help to relieve pressure and help further bunion growth. More serious bunions may require surgery. Book an appointment today and let Physiomed help with all your foot care needs.